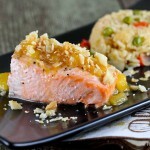 A Week of Discovery and Smoked Salmon Quesadillas - What about the food? If you think about it, after a lifetime in your field, how many chances to you get to give back to those coming up the ladder behind you? In an information age, dominated by software changes every six to eighteen months the notion of apprentice and journeyman are blurred. Who is the new craftsman, what skills are needed for this new age? Creativity, problem solving, team work, organizational awareness and adaptiblity come to mind. I find that people get locked into their jobs and forget about the opportunities for coaching and mentorship. If, after a lifetime spent on the job, you forget to share the wisdom and lessons learned along the way, then what indeed is your legacy when you’re no longer active in the field. There is no marble statue, or perfectly crafted silver tea set that stands the test of time. Luckily for me I had a chance to spend a week just doing that. Giving back and helping others validate their innate strengths and offer non-judgmental feedback on areas to strengthen. To share what has taken a career life to learn and turn it into teachable moments. It was a grueling week in an idealic setting. Who wouldn’t think that a week at Asilomar would be a picnic. The weather, the best the peninsula could offer with cool bright skies, the steady rhythm of the ocean waves pounding in the near distances between our conference hub and the beach. Inside the meeting rooms an earnest intensity vibrated. We worked from 6:30am to 9 or later each night — all week. Actively learning, writing, thinking, and talking amongst ourselves. Developing bonds that bore the markers of friendships held for years. For all of us it was an opportunity to learn about ourselves in safety. At the end of the week, the next step on our personal journeys lay before us. 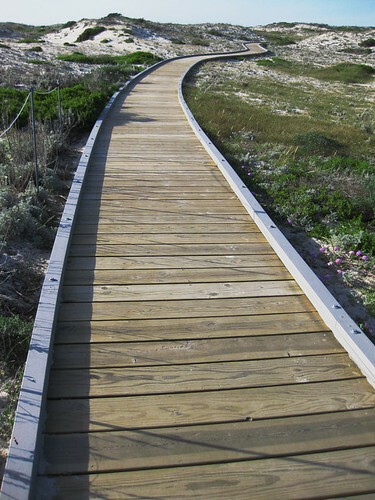 Asilomar State Park Boardwalk – What is the next step? What on earth does this have to do with food you ask? During our communal meal discussions my interest in food became evident to the delight and possible dismay of my table mates. 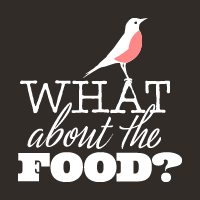 On the last day, a dining companion said, “…but what do you eat during the week?” After driving over an hour to get home, greeting my dear husband and dogs (plus a quick nap) I had the answer. Smoked Salmon Quesadillas! So, dedicated to my new found friends is something to celebrate the Cinco de Mayo meal we missed at Crocker Dining Hall. 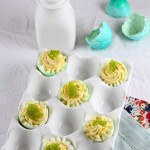 A little delight that goes quickly from prep to table. 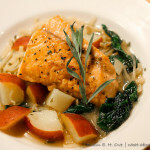 Remove skin from Smoked Salmon and shred with forks in small bowl. Add finely chopped chives, sour cream and Picante sauce. Set aside. Cut and remove seeds from tomatos, finely diced. Preheat 12” skillet over medium high heat for about 2 minutes until hot. Lay 1 10-12” flour tortilla onto skillet and warm on one side (about 30 seconds), flip. On one half of the tortilla, add cheddar cheese, ¼ smoked salmon mixture, a bit of shallot and diced tomato. 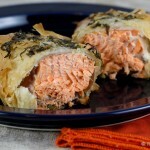 Sprinkle with Swiss Cheese and fold tortilla in half. Press with spatula and cook 1 minute, flip and cook 1 minute more. Tortilla should be slightly browned and crispy on each side. Remove let cool a minute or so and cut in half and serve. 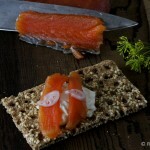 I loved reading about your interesting week and celebratory, savory smoked salmon quesadillas! Another recipe that rings with flavor, Robin! I debated whether to write about my week, so I am very glad you enjoyed reading about it. 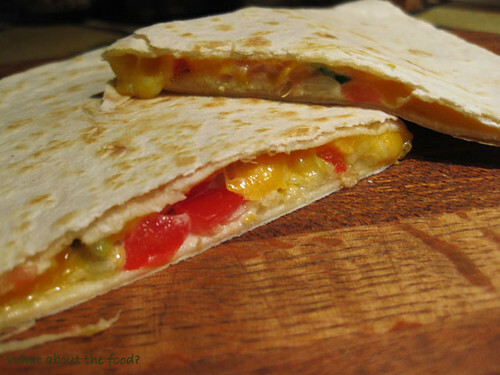 The quesadillas just came together using ingredients on hand — certainly not preplanned! Sometimes that’s what brings on the creativity, don’t you think? Can’t wait to see what’s next at Bentobird!